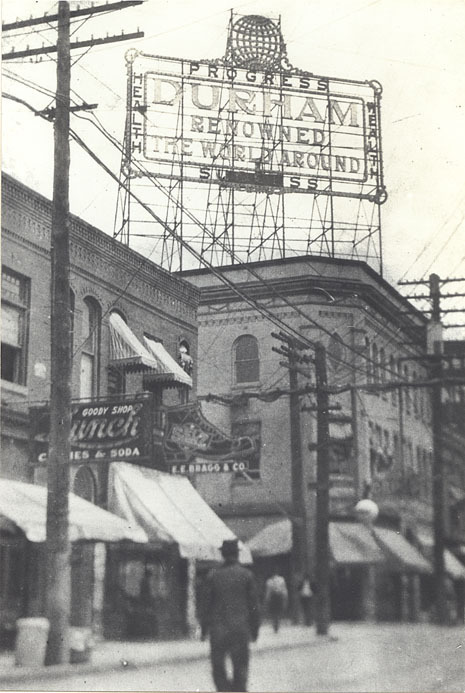 In 1913, the Durham Traction Co. (later Duke Power) offered to pay to erect a large electric sign lauding Durham, as a gesture of thanks to downtown merchants who had purchased electric lights. The Commercial Club (later the Chamber of Commerce) sponsored a contest to decide the slogan. 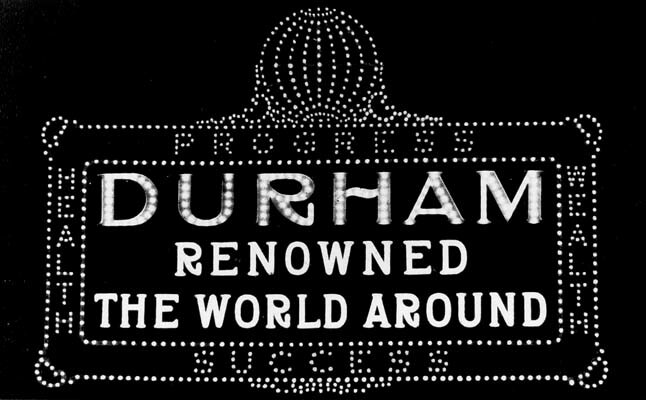 The winning entry, from WW Weaver and JE Banning was "Durham: Renowned the World Around"
The sign was erected on a moonlight night on December 15th, 1913. In addition to the slogan, it read "Health, Wealth, Progress, Success" around the circumference. The sign was 31 1/2 feet wide and topped by a "10 foot sphere". It required 1200 bulbs to operate. It was illuminated to a crowd of either "hundreds" or "thousands". The sign, unfortunately, only operated "a short while" before being destroyed by a storm. Pity - perhaps we would have been spared several dozen progressively inane slogans had it survived.